SHOWCASE 2018 - FLAMING IDIOTS! Since its founding, the Tatnall School has prided itself on our appreciation for and promotion of the arts, academics, and athletics. Many schools offer after-school activities in both the arts and athletics, but Tatnall has taken one step further to give our students the opportunity to make theatre a part of their curriculum as members of Showcase: Advanced Production and Design. Showcase is the longest running theatre program at Tatnall, entering its 55th year, with 46 years’ worth of those productions having been directed by Dr. Bruce Chipman, our Head of English. Since 1963, Showcase has always been met with high expectations, producing exceptional results. Many Showcase vets go on to work as professionals in the performing arts, both in technical areas and in front of a camera or on stage. Class begins in November when the cast and crew alike commence the creative process as a company. Dr. Chipman provides the company with the insight needed to understand just how imperative it is to collaborate from day one. No actor is more important than another actor or crew member. This is made extremely obvious as we move into the PAC after winter break and begin tirelessly working to move the play from script to stage. During this time, the importance of the crew and Rick Neidig, Technical Director for over 30 years, becomes apparent as they efficiently craft the set from the ground up. The theatrical flats then become the canvas for our set decorator, Paula Woolfolk-Cohen. Her talent for design and painting has added a realistic and artistic feel to many Showcase sets in the past. Edward Stein (‘91) has played a pivotal role in helping the actors truly embrace and become the characters that we are portraying. The knowledge he has gained working as an actor in both New York and Los Angeles provides us with the insight needed to depict the characters with as much accuracy and life as possible. Tessa LaNeve (‘01) is the newest member of our fearless team of adults. Tessa’s experience working in New York has brought essential guidance to both cast and crew, helping our company reach a professional level. Robin Laskey Chipman, since 1983, has worked persistently, adding the final necessary designs for hair and makeup. “Costume Mom” Mimi Walsh (former Board member and Tatnall parent) uses her talents to create costumes that are historically and culturally accurate. Showcase wouldn’t be possible without our team of adults (whose cumulative Showcase experience totals to over 160 years!). This year our team of adults is joined by three recent alumni: Molly Soja (‘17), Bobby Jeffers (‘17), and Nicole Foley (‘15) who are assisting in aiding the students in producing a truly extraordinary show. Showcase is a completely student-centered endeavor: set construction, scenic design, posters, programs, musical transitions, etc., are all products of collaboration within the entire company. 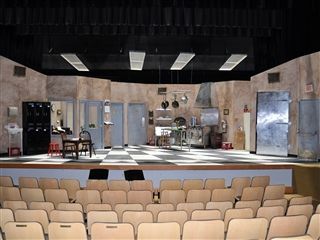 Showcase at Tatnall is often praised for its high quality productions of many famous shows such as The Women of Lockerbie, The Laramie Project, and The Diary of Anne Frank. This year, Showcase is taking a step back from the heavy dramas, and staging a silly comedy. Flaming Idiots is a lively farce depicting the misadventures of two ex-postal workers, Phyllis (Sophie Brown ‘18) and Carla (Claire Ireland ‘19), as they try their hands at running a restaurant. After a rocky start to their latest endeavour, the girls devise a “flawless” scheme to get their restaurant on the map, involving a retired hitman by the name of Louie (Chris Johnson ‘19). However, the waiter, Eugene (Trey Jones ‘18), busboy, Ernesto (Bill Carroll ‘18), and chef Bernadette (Phoebe Tompkins ‘19) have other plans, involving the clueless Officer Task (Conner Malley ‘18) and Jayne Fryman (Lucie Dionne ‘20), a newspaper reporter who gets a lot of exposure. Hilarity ensues, and the comic touches of slapstick, subtle innuendos, and general buffoonery in the show are sure to be a riot for anyone in attendance. As with all shows, it would be nothing without the support of the Stage Manager (Elizabeth Hamilton ‘19), Production Manager (Nadine Mon’gare ‘17), and a crew that has been building the set from the ground up. Aside from bringing the set to life, the crew has been designing costumes, engineering lights and sound, and ensuring the show both looks just right and runs flawlessly. The entire Showcase company of 28 students all hope that you will come to Flaming Idiots on February 22, 23, 24 at 7:30pm in the Laird Performing Arts Center. Tickets will be sold at the door: $10 for adults and $8 for students and senior citizens. All ages are welcome. SHOW CASE 2018: FLAMING IDIOTS! !